Oh, patents. They’re fun for about two minutes, then you realize that companies file patents for every cockamamy idea that R&D devises. (Also, to receive a patent, you don’t even have to prove that your idea actually works, which I learned while reading Michio Kaku’s book. It’s a nice thing to know when you see a product advertised on TV as holding U.S. patents numbers 12345 or whatever—they hand out patent like old ladies hand out candy corn on Halloween.) But to the point: Apple filed a patent that shows a front-facing camera on the iPhone. Such a camera would make video calls a possibility. Get excited. 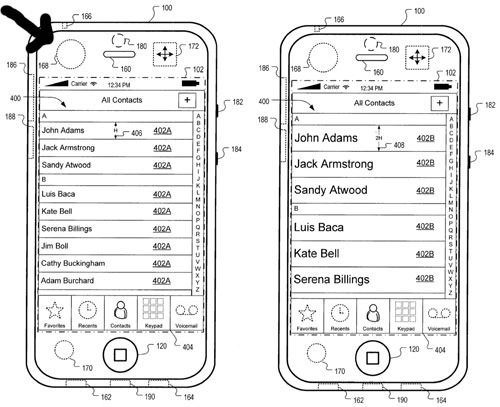 The patent application, which was published today, shows Apple’s thinking when it comes to user interfaces. Cupertino is trying to tackle the issue of controlling the iPhone while the user’s attention is elsewhere. Let’s say you’re jogging—you don’t want to scroll 1,000 scrolls just to find, um, Kate Bell, do you? No! So the iPhone, in this scenario, alters the user interface. Icons are bigger and less work (F=(d/dt)*(mv)) is required by you to get to your contact. Big deal, right? The biggest news here, which in no way reflects its position in this here post—inverted pyramid says “hi”—is that front-facing camera. But, again, all of this is merely patent talk, and could well be rubbish.